Traditionally, the charm of the capital has never failed to attract young millennials across the globe. With its lucrative job opportunities and unprecedented rooftop views, you quickly find yourself amidst the young crowds here to pursue a lifelong dream. Although, we are very familiar with the phrase ‘everything comes with a price’. Cost of living in the capital has dramatically increased making a decent living almost unaffordable, as house prices bear no relation to income. Unregulated rental prices by private landlords consume almost two-thirds of average salary. “We need to do everything we can to help Londoners who are struggling to pay their rents. That’s why I’m working with housing associations and councils to build new homes for ‘London Living Rent’” said Sadiq Khan. Millennials with their sights set on living in the capital face the challenge of adapting to the high cost of living. From day-to-day costs, leisure activities and high rental prices it can seem rather discouraging for those not on the property market. Oliver Smith a young professional born in Birmingham who recently moved to London and explains how he has been living in the capital. As the capital continues to draw people in, we wonder how long before pull turns to push. For many, renting a double bedroom or 1 bedroom studio flat in the capital is the more viable option to truly enjoy their experience in London. But this can be quite problematic as tenants face the issue of finding a suitable place at an affordable price “It’s always important for me to be in a comfortable environment after a long day at work, finding a good space would cost me between £650-£850” Gilberto Escagio told us. 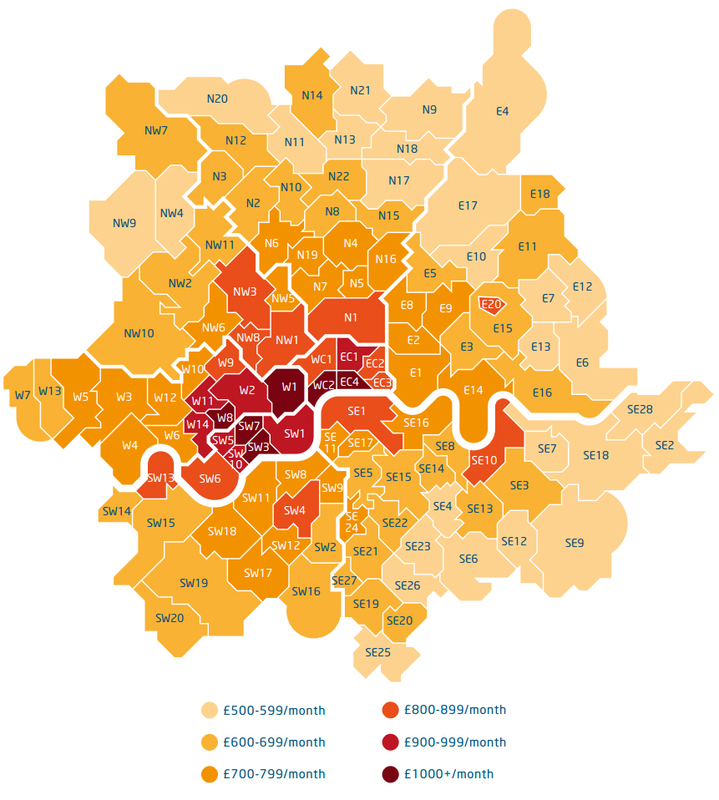 Below is a map illustrating the average rental prices in the capital. With rent in the centre of London sky high, the unregulated and increasing rental prices mean landlords are applying the pressure on tenants to who are simply struggling to afford the rent. Saving for a mortgage might appear unimaginable, while still trying to live a normal lifestyle. this could be detrimental towards young millennial’s who eventually dreaming of purchasing their own homes in the capital may be cut short. The question above many heads is whether millennials have accepted this fate and instead chosen to spend their money on avocado toast? rather than owning their own property considering the average house price is valued by Zoopla at £658,016 increasing by 0.66% in the last 12 months. London will always remain a popular attraction for millennials, which might require sacrificing a cheaper cost of living or abandoning the prospect of owning a home. although one foreseeable option for the future has seen many consider renting further outside the capital in search of a more affordable lifestyle elsewhere.